Deputy of Arkham is a special card. It first appeared in the Arkham Horror board game. 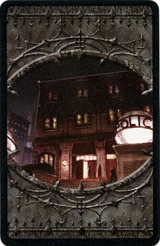 An investigator becomes the Deputy of Arkham by completing the unique encounter at the Police Station. When you gain this card, take the Deputy's Revolver and the Patrol Wagon as well. This page was last modified on 1 April 2009, at 07:52.